Camping Serenella is a luxury camping site located in Bardolino, a charming town that enjoys a spectacular location on the southern shores of Lake Garda. Surrounded by beaches, olive groves, vineyards and picturesque villages, this campsite is equipped with everything you need to enjoy a high-end camping holiday in one of Italy's top destinations. Contact the Lux-Camp team to book your stay in Lake Garda. Why should I camp at Camping Serenella? A serene natural environment that invites you to relax and unwind. Wake up to the sound of waves crashing on the lake shore or enjoy a colourful sunset from the comfort of your mobile home. Plenty of family-friendly activities on site and in the surrounding areas, including amusement parks, boat tours and more. Accommodation in spacious and beautifully decorated mobile homes that boast large indoor and outdoor living areas. Activities to suit every interest and age group, from sports to festivals and including arts and crafts courses. 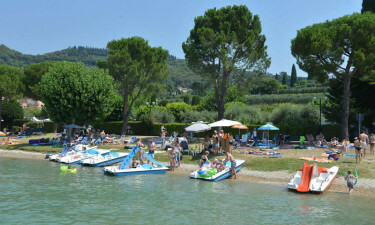 Water sports lovers are perfectly catered for at Camping Serenella. 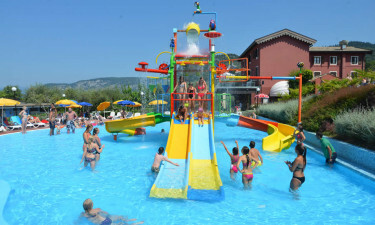 Here you can enjoy a swim at Lake Garda or have a fun day at one of the 3 swimming pools available on site. Other facilities include a parasailing and water skiing centre, professional entertainers, free courses and multiple sports facilities. Camping Serenella offers you a chance to sample the best of Italian cuisine at its restaurant, which features an open-air terrace with panoramic views. A poolside bar and take-away service are also available, as well as a fully stocked supermarket and a grocery store. In short, Serenella has all you need to experience luxury camping at its best.